President Obama and Transportation Secretary Ray LaHood may have been disappointed by Santa Claus one long-ago Christmas. I’m guessing they each hoped for an electric train set and got something else, like the Kenner Easy-Bake Oven.Not that there’s anything wrong with toy kitchen equipment, especially when it makes real miniature cakes. Maybe Obama’s and LaHood’s presents got mixed up with mine. I wanted the oven but ended up with a train set. Such a traumatic childhood disappointment might explain why the president and his cabinet member now seem determined to get the biggest, baddest trains possible, no matter the cost. The federal budget Obama will unveil today is expected to call for more than $50 billion in spending over a multi-year period for high-speed rail in various parts of the country. The 2012 fiscal spending plan would include an $8 billion down payment that, alone, probably won’t run a single train on a single mile of track. In an ostensibly separate move, the New York and New Jersey congressional delegations have cooked up a plan, no doubt in collaboration with LaHood’s fellow engineers, to spend $13.5 billion on a new trans-Hudson tunnel. This comes just three months after New Jersey Gov. Chris Christie killed the last plan, which had a sticker price just under $10 billion, but would have cost substantially more. The new “Gateway” plan would also be more expensive than New York City Mayor Michael Bloomberg’s proposal to extend the city’s subway to Secaucus, N.J., though that service would be more limited. High-speed rail has a natural constituency in the Democratic Party. Any large, federally-funded public works project must by law pay union-scale wages, regardless of whether unionized contractors are used, which means unions love them. Environmental advocates seem to believe that Americans will abandon their cars if they’re presented with faster trains. And Democratic economists and political strategists see a big dose of public works spending as the economic shot in the arm that could boost the prospects for their party – and the president – in 2012. The problem is that none of this makes a lot of sense. Americans have a public-private passenger transportation model that already works, based on the combination of cars and aeroplanes. The government provides the basic infrastructure, like highways and airports, generally with taxes collected from those who use such services. Then the users pay, privately, for the cars and the aircraft. Freight traffic likewise pays its own way on the rails and in ports, though the government finances services like the coast guard, river locks and a network of navigation aids. Few if any passenger rail systems can claim to be self-sustaining. Government must subsidise the capital cost of rail cars, as well as the infrastructure of tracks and tunnels. Often, those cars are poorly maintained and out of date. Right now, service on one of the busiest commuter rail lines in the country – Metro North’s New Haven line between Manhattan and Connecticut – is sharply reduced because too many of its cars have failed under this winter’s rugged conditions. We are not Western Europe or Japan. Large numbers of Americans are not going to take long-distance trains from New York to Chicago or from Phoenix to San Francisco. Flying will remain much faster, and driving will remain more convenient, less expensive, and not that much slower door-to-door than even the fastest trains. On popular routes, privately financed aeroplanes will continue to provide much more frequent and convenient departure times than the scarce, publicly funded rail cars. Cars and vans will continue to allow travellers to control their own departure times and to stop as frequently or infrequently as they like. None of this is new. The U.S. had a state-of-the-art passenger rail system before the interstate highway network came along. With aircraft offering speed and cars offering convenience, long-distance passenger trains became a solution that lacked a problem. There is also politics to consider. We won’t get a very expensive high-speed rail network that only covers a few high-volume cities and states. It will be Amtrak all over again: Every senator will demand that the fancy new trains make at least one stop his or her state. 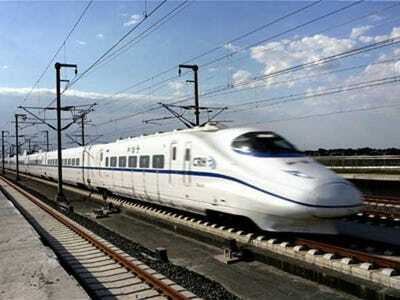 When stationary, though, a high-speed train doesn’t go any faster than an ordinary one. The more stops, the less likely a high-speed train will be able to offer airlines any substantial competition for speed. What about the economic benefit of all this infrastructure spending? On that front, consider Japan. The Japanese have spent themselves silly for two decades, building everything they can think of in response to their long slump. The country has the nicest trains, highways, dams, bridges and tunnels in the world. It also boasts an economy that has failed to grow, and a population that continues to shrink. This with infrastructure spending that, as a percentage of GDP, easily outstrips any U.S. attempts thus far to stimulate the economy. The trains are expensive. The trains are unnecessary. And buying the trains won’t revive the economy. Still, big boys want their big toys. Let me suggest something else: a superconducting particle supercollider. (Almost as hard to say in one breath as an Official Red Ryder Carbine-Action Two-Hundred-Shot Range Model Air Rifle, but less likely to shoot your eye out.) We tried to build one once before, but the project was canceled in 1993 for budgetary reasons. Instead of reviving the choo-choo, we can revive that project instead. It’s high-tech, flashy, and probably has more utility in the 21st century. And besides, it would be one big, bad Easy-Bake Oven.